Fantastic, old fashioned customer service from Kris and Landas at Storage King St Lukes. Always welcoming with a smile and the free coffee is a bonus! The staff are friendly and easy to deal with. Payments are hassle free and we are always kept informed of any changes and important information. Excellent service! Landas is the best person to work with, kris has been as much as help as Landas. The dream team. Thus far I have had the best experience with the team. I'm going to miss the team at St Lukes Storage King, you are like family to me after almost two years of storage. Luckily you're right next door to my gym, so I can pop in and update you lovely ladies on all the latest news :) I would highly recommend this team to assist you with all your storage needs. Super nice & highly professional when it comes to customer service !! Great service from the staff, more then happy to help and always smiling. Great place for storage if you need storage in the area. Our company has utilized The Storage King, St Lukes or the past 3 years, and the service has been above and beyond! Jason, Kris, Kim and the team are always helpful and friendly, with nothing being too much to ask. They are always willing to go the mile for their customers! 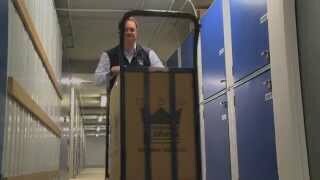 If you are thinking about using The Storage King, St Lukes, I would not hesitate! From the first visit - rated the place highly. Awesome team, they all know the products and services they sell inside out, and do it with a genuine smile. It's easy to tell they enjoy their work and dealing with their customers - and the rest of their team. Nothing was too much of a problem, and they spent all the time necessary to make sure that I was happy with what I was getting for my money, and that all systems were explained thoroughly If I ever need to use storage again, I'll come back here without doubt. I wouldn't even shop around for pricing - the experience I had with staff and the facilities at Storage King St Luke's means I won't consider going anywhere else from now on. The service was great and the staff were always friendly and helpful. I needed a place to store my things while I was away in the UK for three weeks. They had the ideal storage space and I was able to get some money back as well since I didn't use the full month's payment. The place is very secure and easily accessible. Staff were very friendly and extremely helpful in getting me sorted out. There is a refundable deposit for the key and affordable insurance is also available. I'd certainly recommend this place to anyone looking for ideal storage solutions. Storage King St Lukes proudly services Mount Albert, Sandringham, Mount Eden, Kingsland, Western Springs and Mount Roskill.